Family Actinidiaceae Hutch. Genera Actinidia Lindl. Far East : Primorsky district, island Sakhalin, Kuril (Kunashir, Iturup, Moneron), Chabarovsky district, south Amursky district; Japan, Korea, China. Species occurs on good drained rocky soils, grows on mountain slopes to 500-1000 m (max h is 1345 m - south Primorsky district; in north of area max h is 150 m). It grows penumbra site in mixed coniferous-broad-leaved and coniferous forests. It occurs in broad-leaved forests on north slopes, there is not in oak forests. In Sakhalin it grows in edge of montan sparse conifer forest to 200-300 m.
Ornamental. Food. Vitaminous (jam, confiture compote, fruit). Berestova G.N. 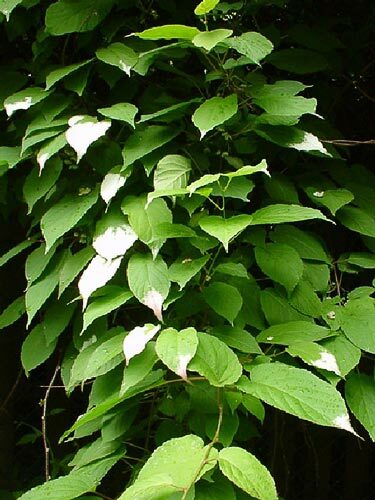 Wild populations of actinidia and magnolia-vine in Primorsky district // Bul. of applied bot., gen. and sel., V. 42, fasc.2, p.298-304. L., 1970. Vorobiev D.P. Review of Far East species of genera Actinidia Lindley // Bul. of Gornotaiegny station of Far East Branch of The Academy of Sciences of USSR, Chabarovsk, 1939, V.III, p.5-38. Woods and shrubs of USSR. M: Mysl, 1966. - 637 p.
Woods and shrubs of USSR. M.-L.: Publ. of The Academy of Sciences of USSR, 1958. - V.IV.- 975 p.
Wild woods and shrubs of Far Earst. L.: Nauka, 1968. - 277 p.
Ermakov B.S. Forest plants in your garden. M.: Ecologia,1992. Kolbasina E.I. Actinidia and magnolia-vine in Russia (biology, introduction, selection). M., 2000. - 264 p.
Osipova N.V. Lianas. M., 1989. Plechanova M.N. Actinidia, magnolia-vine, honeysuckle. L.: Agropromisdat, 1990. - 87 p.
Titljanov A.A. Some problems of Actinidia investigation in Soviet Prymorie // Bul. of V.L. Komarov Botanic Institute of The Academy of Sciences of USSR. Ser. VI, fasc.7, p.149-151. L, 1959. Flora USSR. M.-L.: Publ. of The Academy of Sciences of USSR, 1949. - V.XV. Jakovlev-Sibirjak I.I. Actinidia. M.: Selchozgiz, 1952. - 40 p.